If you’re like me, you’ve got one of these cute little numbers tucked neatly away in a kitchen cabinet: a mini food processor, also known as a food chopper. Our little guy sits morosely behind its big, beefy cousin, the Ninja. Little chopper longs to do its part in the kitchen and give the cutting board and knife a break. We often hear about food processors and food choppers, but what’s the difference? According to the experts, the two appliances are sometimes confused. It’s not uncommon for food choppers to be referred to as mini food processors. A food chopper has a 1 to 4 cup capacity and can chop, mince, grind or mix different foods. 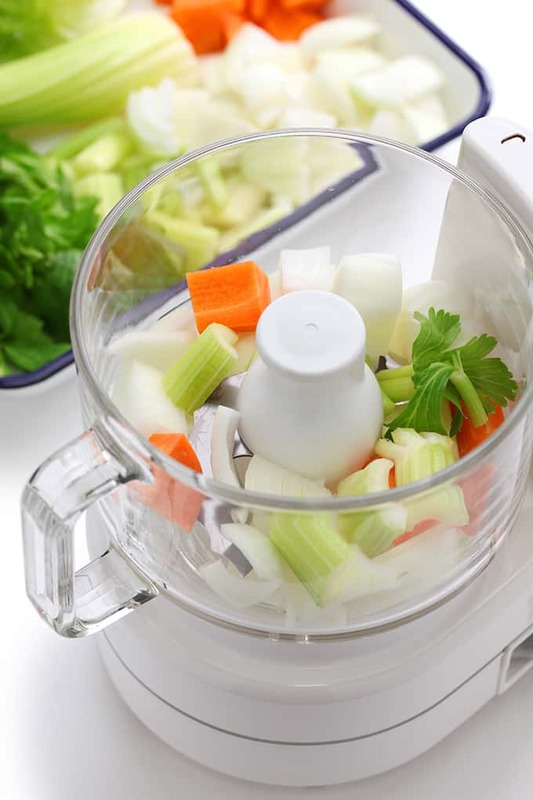 A food processor holds 7 to 12 cups of food and can do the work of a food chopper and more. Some models can knead the dough, and come with feeder tubes and other fancy add-ons. 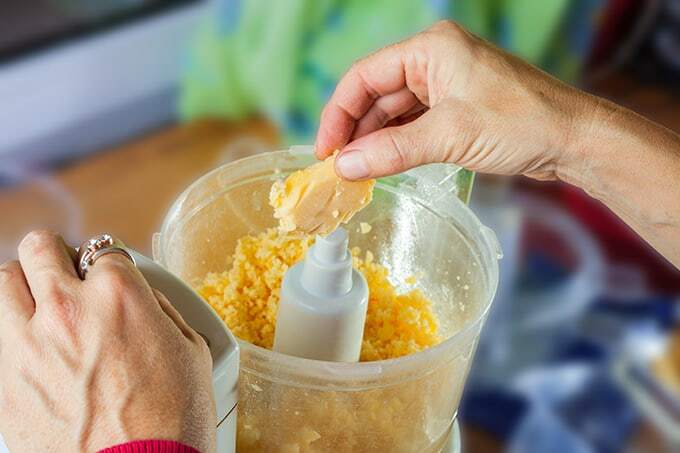 We even have a listing of several smart ways to use a food processor. Before we can talk about how we can put our mini food choppers to work, let’s find one that fits your needs and style. Amazon carries a Black & Decker model for under $20, and I like the compact size, ease of use, and that it’s dishwasher safe. The 1½-cup capacity is ideal for prepping ingredients in small quantities. Before turning it on, just make sure you line everything up according to the directions and securely lock the little guy into place. Cuisinart carries a few different models that start around $30, boasting more power than their competition. These mini food processors also have 2-speed operation and you can choose from several different colors. Walmart carries a variety of appliances including this Ninja Express chopper. You can call or visit your local store to see what brands they have, or if you order from their website they will ship it to you or to your local Walmart for pick up. Appliance giant KitchenAid also makes a mini food processor, we found this one priced at $39 at Target. Like Walmart, Target also offers shipping and store pick up. The food chopper, unlike its big brother the food processor, is lightweight, can be stored easily in a cabinet and does not hog precious counter space. 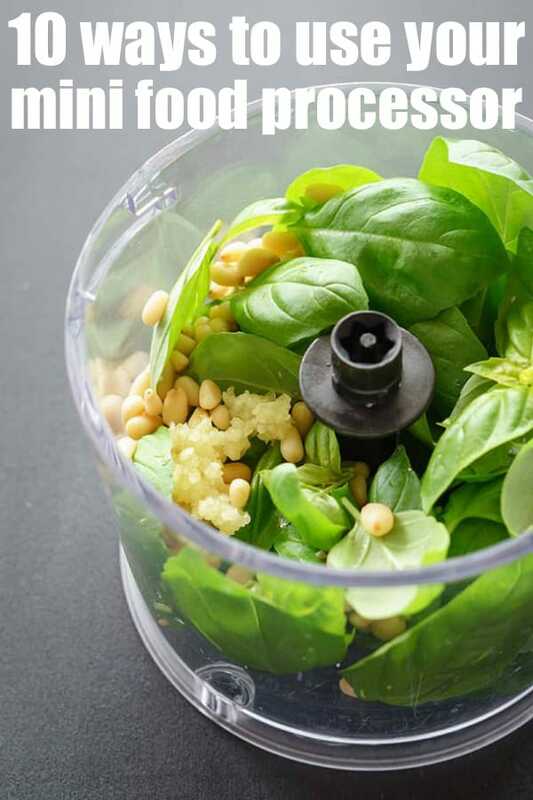 Now that you’ve found the mini food processor that fits your needs, there are several ways to put that little workhorse to good use. Mincing or chopping veggies. Toss carrots, celery, green peppers, onions, broccoli, garlic, or whatever you need to add to a salad, chili or stew recipe. Warning: the blades work quickly, so a couple seconds will yield larger pieces while holding the button for a longer time will mash the food. Guacamole, anyone? Shove chunks of avocado into the container and sprinkle lime juice, dried onion flakes and garlic salt for an easy guacamole fix. Homemade marinara sauce. Over pasta, homemade marinara is so much more delicious than canned. Combine tomato and onion pieces, garlic, basil, and oregano. Warm on the stove or in the microwave, and voila! Homemade baby food. Cook up sweet potatoes, green beans, apples, or whatever your baby desires. Allow the food to cool, and puree until reaching the desired consistency. Hint: you can divide the pureed baby food out into an ice cube tray and freeze. When ready to use, pop out the desired number of cubes and thaw in the microwave, making sure to check the temperature before feeding baby! A fruit smoothie. Combine yogurt with berries, banana, pineapple or peach chunks and your desired liquid to blend a quick, single-size smoothie. Chopping nuts. Toss some in to add smaller-size nuts to your recipe. Or, to add a nutty flavor to a recipe without chunks, your mini can finely chop them to achieve a crumble or paste texture. Hint: you can make your own nut butter using a mini food processor. Check out these great instructions. Dog treats. Don’t forget your furry friend! Curbly shares this easy dog treat recipe that can be prepared with your mini chopper. Chocolate chunks. The words literally make my mouth water. Add chunks of chocolate to cookie recipes or sprinkle them over ice cream sundaes. Salsa, salsa, salsa! You can make restaurant style salsa from canned tomatoes, onions, peppers, and cilantro, but chunky salsa is also easy with a mini chopper. Making homemade pesto. 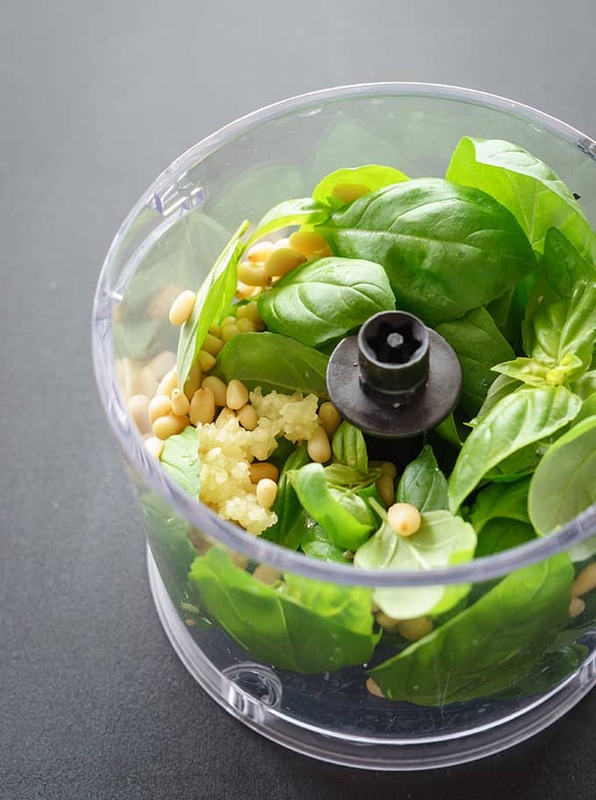 Homemade pesto is delicious on pasta, and you can quickly bring together a batch of basil pesto or sun-dried tomato pesto in this handy little appliance. True, sometimes a few quick chops with a knife is easiest. But when your ingredients require more attention, let the mini chopper do its thing. Megan Gladwell, a freelance writer and editor, resides in beautiful Northern California. In addition to spending time with her husband and four children, she loves reading, mentally editing everything she reads, inconsistent running, yummy food, bargain shopping, and traveling.